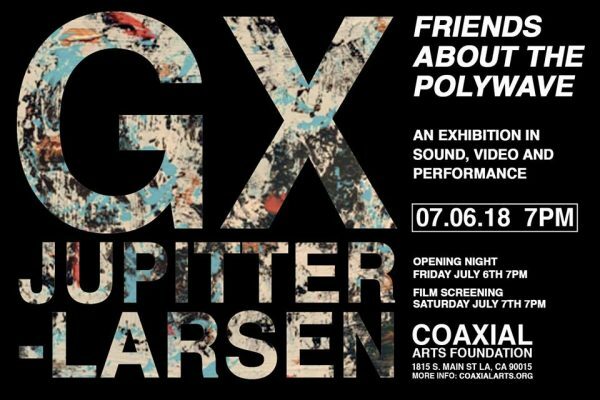 We are so excited and honored to have the legendary and mysterious Los Angeles based Artist GX Jupitter-Larsen as our next ARTIST IN RESIDENCY! With a very special live performance collaboration between GX & Crank Sturgeon! “Thinking of life in terms of the urban backdrop essentially becomes a straightedge. A population’s shared experience becomes the calibrated lines of measured distances. In other words, the personal occurrence as a subjective mathematical glimmer. Time-line as a ruler, or if you prefer, the ruler as time-line. Every step I take down the sidewalk is another increment along a readymade ruler. For myself, if I were going to use my old home town Denver as a ruler, its increments would have to start out with how my friend Bob always lit his long red hair on fire. To be followed by my many hours of watching televised weather reports. The final glyph would be how a group of us once regaled a cornered Stan Brakhage with tails of riot-inciting performance art.